The Angels Landing Trail is one of the most famous and thrilling hikes in the national park system. Many people travel to Zion National Park in Utah for this hike alone. This was a life-changing hike. It is not only the view at the end that is amazing; it is the whole experience of getting there. The trail is roughly five miles long with an elevation gain of 1488 feet, and it take about 4-5 hours round trip to complete. The trail starts relatively easy, but after a mile or so it gets hard and steep, and by the end you are clinging to chains, climbing rocks, gazing down insane drop offs, and experiencing the thrill of your life. This hike is not for the faint of heart, but the everyday hiker with an adventurous heart (and no major fear of heights) can do this! Here are five tips to help you conquer Angels Landing. Then the trail quickly begins heading up! From the beginning to the end of the hike we experienced so many different temperatures! I went from wearing long sleeves, to a tank top, back to long sleeves, and back to a tank top! It was hot and sunny one minute and snowing the next. The temperatures change in different parts of the canyon, and the precipitation can change quickly. Be prepared. Also, remember you have to carry the layers you take off, so plan as smart as possible. This is an extremely difficult hike and a positive attitude is a must. The beginning of the trail is relatively easy, but makes your calves burn. Then comes Walters Wiggles. A set of 21 steep switchbacks. This is hard, but manageable if you take it slow. Know your limits and allow yourself to sit down on a rock to rest. Enjoy the experience and take your time. Give yourself credit for every step you take on this hike; you are a badass hiker if you are on this trail! This was something I did wrong. I wore good shoes, but they were several years old. I wore an old pair of Keen hiking shoes that I love, but the tread is completely worn out from all the miles I have put on them over the years. It was also obvious that many people did not wear the appropriate shoes, as there were piles everywhere once we reached Scout Lookout. At this point of the trail, you start scaling the rocks and using the chains to climb the final section of the hike. These rocks can be very slippery, and we saw many people who decided to go barefoot rather than trust their shoes. I wore my shoes, but I did slip multiple times (luckily always when I had a good grip on the chains!). Before you take on tis hike, invest in a good pair of shoes ! We brought beef jerky and trail mix, as well as one large water bottle each, and this was the perfect amount for us. It’s not a super long hike, but it is physically taxing, and you will burn a lot of calories. Near the end of the hike we ran into a woman who was by herself, with no shoes on, clinging to the chains, almost in tears because she could not walk due to her legs cramping. We sat with her and gave her water, and luckily she was fine. This moment reminded us of the importance of drinking water and taking care of your body. Also note, there is a bathroom at Scout Lookout, so drink as much water as you want on the way up! It’s OK to stop at Scout Lookout. While I totally urge you to complete this hike, it is still worth it if you stop at Scout Lookout. Know your limits. Almost everyone we met on the way up stopped once they got to Scout Lookout. This is a beautiful view point, and it is a beautiful hike. Making it to Scout Lookout is a great accomplishment. From Scout Lookout you also have a great view of the people who do choose to go on the complete the chain section of the hike. My husband and I loved this hike. I remember multiple times we talked about how we could not believe “WE GOT TO DO THIS.” We were so amazed that just two regular hikers from Minnesota like us were even allowed to do this epic hike! Honestly, when we got to Scout Lookout and first saw the chains, it seemed crazy that they allowed it, but as we did the hike and made our way to the summit, we felt comfortable and safe – and ON TOP OF THE WORLD! Have you Hiked Angels Landing? Did it change your life? Another favorite of mine at this park is, The Narrows. What other hikes are there, like this, that you think I should try?! Please share! I just did my first day hike on the Appalachian trail this past fall in the Smoky Mountains! It was gorgeous, but yes, much different from the west! I hope you get a chance to hike out west soon! You will love it! 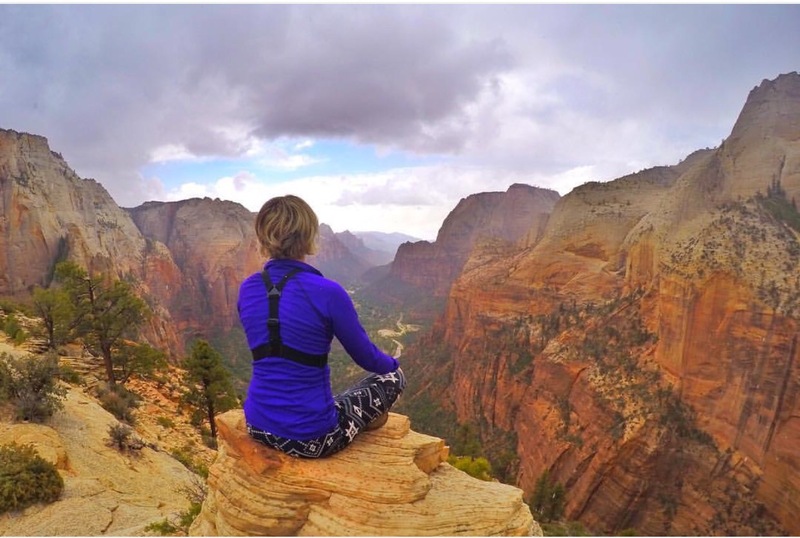 Great post, Angels Landing looks like a tough, but beautiful hike. Love your pics! Awesome post! I’ll be visiting Zion this April and I can only dream of hiking Angels Landing. Between the elevation gain and a small fear of heights I doubt myself. I had no idea about Scout Lookout so I’ll be looking into that-sounds like a great roundtrip hike for those of us who don’t have faith of making it the entire way! Have you done Mount Rainier? I have not but I am planning a trip there this year! I haven’t researched hiking there much yet! You are absolutely right. This IS the hike of a lifetime. Most hikes in UTAH BTW have at least a 1500-2500 ft gain. This however is an amazing hike for the views as you mentioned. Welcome to UTAH! Thanks so much! It was awesome! I hiked Bryce Canyon today and fell in love with Utah all over! Awesome pics! You go on great adventures. Looks like an amazing hike. Wonderful post and very inspiring…when I go back I will take your tips to heart as I didn’t make it all the way last time I went. BTW, how did you manage to do the crow pose up so high? That is amazing! I can barely manage to do that on my carpet! Aw thanks! Yes it is soooooo amazing there! I cannot wait to visit again! so beautiful! I really want to do this hike again.. did it about 8 years ago – but I think I was more fearless then! Now I think I would be way more scared! nice job on completing it and helping someone out along the way! Thanks! I too have gotten less fearless as I have gotten older! ha! =) It was amazing, I hope you get the chance to do it again! Wow, what a beautiful and thrilling hike. I should add Utah to the list of places I should visit in the US, just for this hike! It’s so similar to my favourite hike at Waterton National Park in Alberta. That sounds great! I have been thinking a lot more about exploring Canada lately! I need to make it happen! =) Thanks for reading! Gosh, I’d love to say I’d make it all the way, I’m not sure my nerves would deal with the crazy narrow heights. But as an avid hiker it is high on my list!! Great tips and love your positive encouragement! !